Show jumping has always been one of the major attractions at Iverk Show and on the 25th August this year will be no exception. From 9.00 am sharp in the morning jumping will take place in four arenas throughout the day. There are competitions for both horses and ponies. Leading with pride of place is the Nissan sponsored Grand Prix with a prize fund of €1,500. With a fence height of 1.35m this is part of the Mervue Equine Leinster Summer Tour. Pre-entry with SJI on line before 4pm on the 23rd August is essential. In all the other jumping competitions entries are taken on show day. 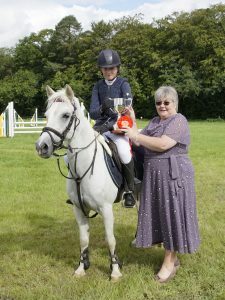 This year there are 22 events from tiny tots on ponies to horses with international riders. For 128 cm ponies there are 80 cm, 90 cm and 1m competitions. The family of the late Andy McCarthy sponsor these. Andy and his family have been involved in the show especially the jumping section for many, many years. 138 ponies can jump in 90 cm, 1m and 1.10 m competitions while the 148’s can compete in 90 cm, 1 m and 1.10 m events. Horse have the option of 1 m, 1.10 m and 1.20 event. In the Sportsman events there are prizes in kind sponsored by Lake Tour Stables, Tramore. Like all our competitions we are very appreciative of our sponsors. The jumping sponsors include the Granville Hotel, Kent Quarries, John Phelan Skip Hire, Connolly Red Mills, Tom Murphy Car Sales, Unecol Oil Co Ltd., Kilsheelan Limestone Quarries, Gaile Rosettes and McBride Car Dismantlers. For full details check out the prize list o our website www.iverkshow.ie.